Snowshoeing brings families together; or at least that was the line I used on my kids when I tried to convince them that this sport was all one we could participate in. 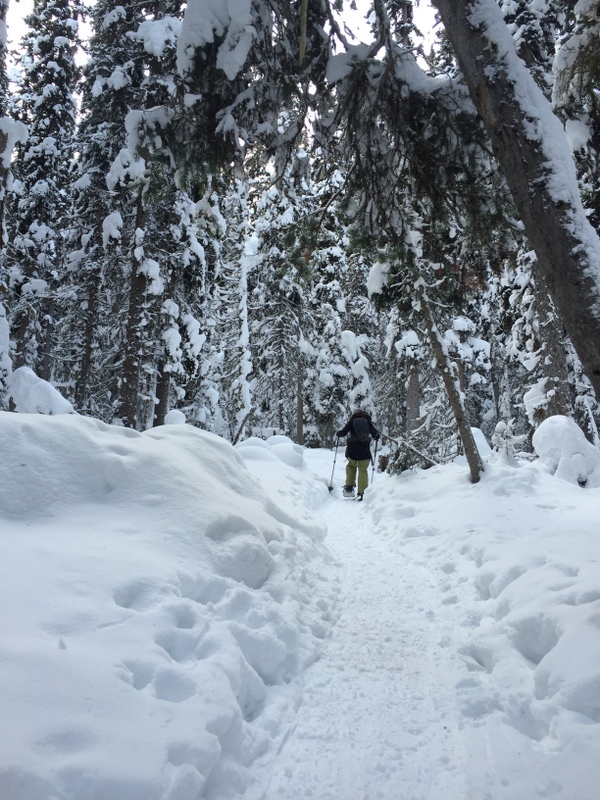 For us, we live in an area that normally receives an abundance of snow and is full of provincial parks, green space and trails; one might say the perfect area for any snowshoer. The problem was that my kids were not so keen on trying out this magnificent sport. You see I have two boys, ages 6 and 8 that would rather be doing anything than hiking with mom. Baseball, soccer, football; these are all things my kids will do in an instant but ask them to take a walk and they balk at the idea. At the beginning of the season I had this great daydream where I would pack a picnic, bundle up and the three of us would go on these amazing snowshoe treks where we would see wonderful sights, listen to the animal sounds and explore nature. Mid way through the season my dream was becoming my nightmare as my kids were constantly tired, thirsty, hungry and bored. And that is when I realized I needed to do things differently. First up was getting them some pretty epic snowshoes. My youngest still very much acts like a six year old and likes things that light up. The Snow Glow snowshoes by Tubbs were my saving grace when it came to him actually keeping the snowshoes on. These beauty snowshoes have actual lights that light up in different colors while you walk. They weigh almost nothing and are easy enough to do up with their 2 buckles. At the end of the season, my son could finally get them on and off himself. The Tubbs Snow Glows are meant for kids his age or younger (my 8yr old tried them on but they were too small) and they truly made a difference in his interest in the sport. On the other hand my 8yr old wanted “cool” looking ones; aka not baby looking ones. I came across a pair of Faber Mountain Kid snowshoes in blue and orange; two of his favorite colors and knew I hit the jackpot. They were easy to do up, look cool like grownup snowshoes, and are sturdy enough to support him. I also appreciated the fact that we were supporting a company that is just one province over from us. He immediately put them on and declared them “easy to walk in.” I am not sure why it took me half a season to realize that the wrong snowshoes can ruin an experience (as I know from experience they can) but once I figured out what exactly my kids needed; we were all set. Next up was to make snowshoeing less “boring” and more exciting. It took numerous tries to find out what makes my kids “tick” but by the end of the season they were begging to hit the trails. First, I gave them each a camera to use; my old ones and we planned ahead what we were going to look for. It ranged from different kinds of trees, animals, tracks and silly poses we could do. I also never once got upset with them wanting to stop too many times to take photos. I found that the more ridiculous I posed for them the more fun it became. I made sure to print the pictures off and create photo books of our adventures. Not only did they want to keep taking them but it gave us an indoor activity arranging the photos when it was too cold to get outside. Secondly, I made sure to take them to interesting trails. Interesting to them means a lot different thing than it does to me and I had to recognize that. They aren’t interested in historic bridges or flat trails that lead to nothing. They want waterfalls and hills and wildlife spotting. Having a goal as to where we were trekking too became important. 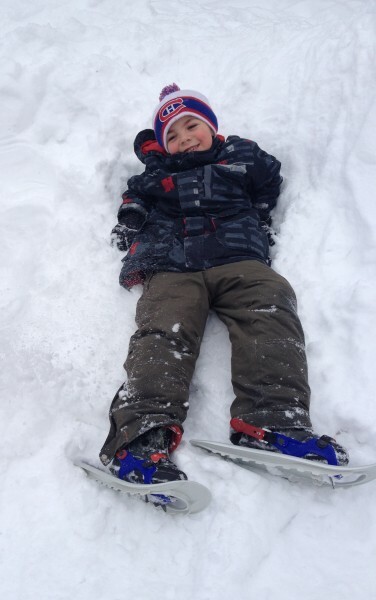 Being able to make snow angels and slide down the hills proved enough of an incentive to keep going and keep walking. Plenty of snacks and drinks are a must. I started packing how much water I thought they would drink and eventually realized I had to triple that amount. My kids get thirsty fast and definitely like to play the “I’m thirsty” card when they want a break. Granola bars, peanut butter sandwiches, Gatorade, fresh fruit and crackers stayed warm enough in my backpack that they didn’t freeze and provided ample energy boosts for the wee ones. My biggest success with bringing my family together in appreciating the sport was to teach them to have fun with it. Taking snack breaks and playing swords with the dead branches for five minutes or playing eye spy in the middle of the woods kept them interested in continuing to walk. It became “let’s go for a snowshoe adventure” rather than just a snowshoe hike. Was it easy? Of course not; there are still days I am itching to get out there and my kid’s just want to snuggle up and watch a movie. But with the above tips, I truly believe any family who is willing to have fun can convince their kids that snowshoeing is a great sport. With a minimal cost, an opportunity to get outside and enjoy nature and exercise while at the same time having bonding time with your family; you really can’t go wrong.